From “Get Fuzzy” by Darby Conley. I am a strong proponent of a free exchange of information and unlimited free speech in cyberspace. Because of the speed at which the Internet has developed, copyright laws have not kept up with the realities of today’s Internet technology. 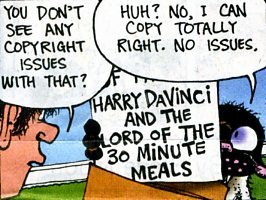 If all the globally existing, regional copyright laws were stringently applied and narrowly interpreted, the Internet could never have evolved to what it has become today. But content creators operate in a strange environment now. On the one hand, it has become much harder to protect intellectual rights. But on the other hand, we have gained many new opportunities for creative inspiration and collaboration, for publishing our work without middlemen, and for freely expressing and promoting ourselves. The vast majority of the material on my site(s) has been created by me. From time to time, I add materials which I have obtained on the web or from other public sources. Although I make reasonable efforts to ask for permission, this is not always practical. In these cases, I operate under the “fair use” presumption. In good faith, I make every reasonable effort to give proper credit to whomever I presume to be the copyright holder. If possible, I establish links to relevant web sites. However, I take the view that once copyrighted materials are placed on a freely accessible Internet site, their commercial value becomes almost zero. Therefore, if someone re-posts such copyrighted materials on another, non-commercial site, the damage to the original copyright holder is minimal or non-existent. If you claim copyrights to any of the material used and object to my usage of your material, please let me know. My site is non-commercial in nature, and I do not pay fees to anyone. However, on your request, I will remove your work as soon as reasonably possible. I have the same policy with regard to the material I myself create and publish on this site. You are free to link to it and to reproduce portions of it on your site. All I ask is that you please credit my name and establish a link back to my site whenever possible.